The mortise is a gap in the violin body sized to hold the protruding neck’s matching dimensions so that they can join together. Like many parts of violins, the neck joint is important to the sound of the instrument. Once the body of the violin has been carved out, and the neck is shaped from a piece of wood, usually maple, the next step is carving the mortise and attaching the tenon of the neck. This process completes the basic structure of the instrument. The first step is sizing the mortise at the top of the violin body. 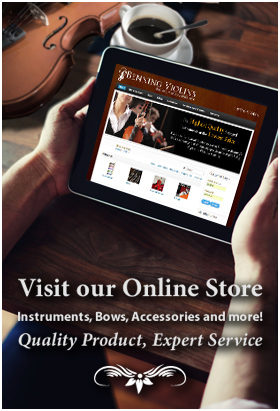 The violin maker makes measurements by holding the root of the neck to the top of the body and tracing it. 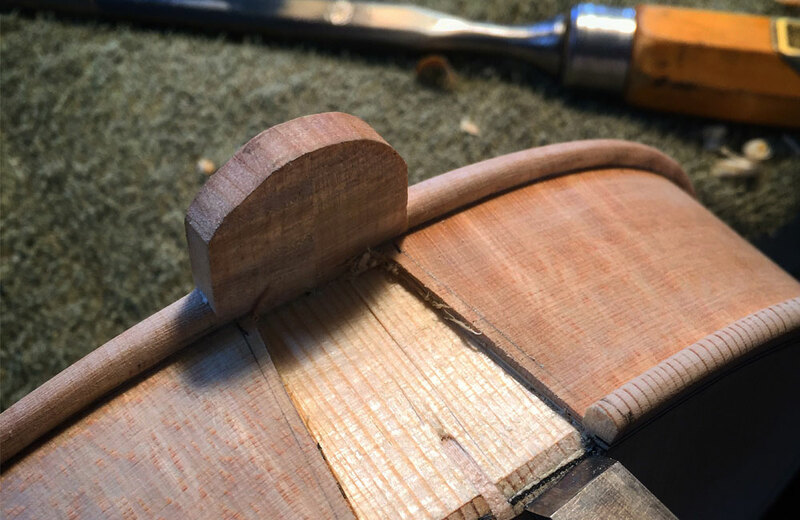 First, the part of the violin top that goes to the edge needs to be scored with a knife and then cut to the depth of the mortise (approximately 7 mm) and removed with a chisel, to protect the spruce top from splitting during further cutting. Then, the lines on the ribs are gently scored, and the whole rib surface between them is removed with a chisel. Through a gradual process of continued chiseling, the block wood is cut away, and the mortise’s sides and back should be made flat and smooth. Before gluing, it is important to center the fingerboard on the instrument, eyeing how it lines up with the body of the violin. If unevenness is due to the mortise, the back of the mortise is further scraped for symmetry. The fingerboard should be about 7mm above the neck root and 21mm above the belly, achieving roughly a 6.5-degree angle from the face of the violin. The violinmaker then applies hot animal glue, warming the mortise. A large C-clamp is used to hold the neck in place, and pads to protect the surfaces. It is left to dry overnight.